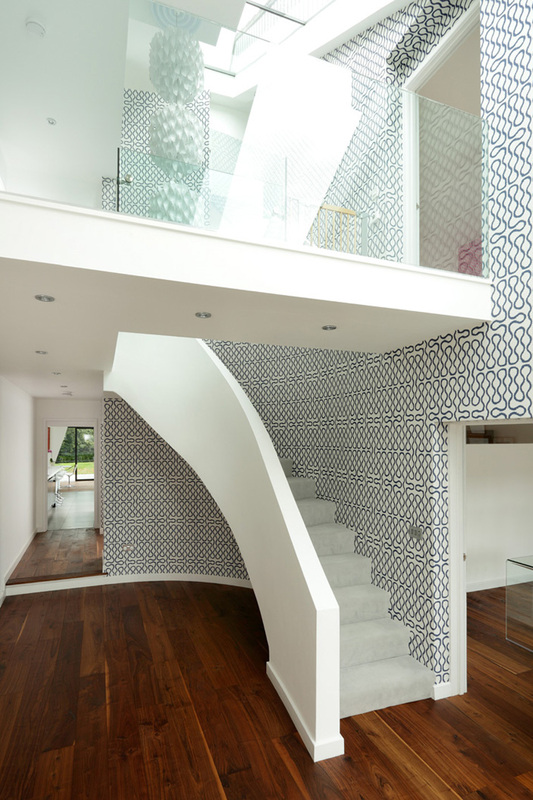 Khoury Architects completeley remodelled and renovated this existing 1970s detached house. 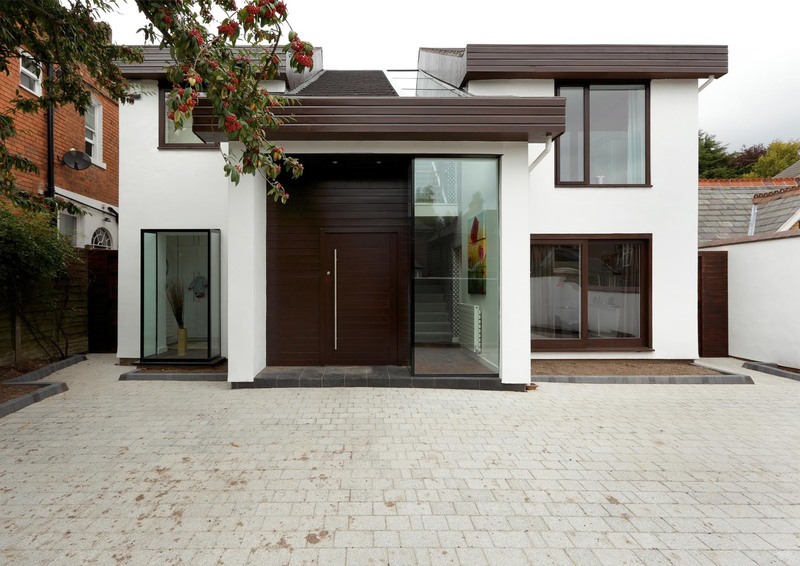 Planning was granted without issue or delay as the front of the house remained largley unchanged. 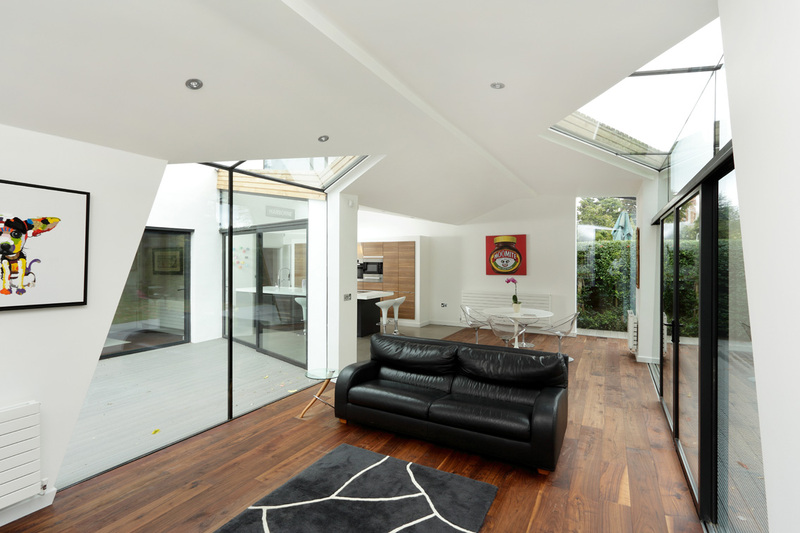 Khoury Architects designed a rear extension and loft conversion to increase the dwelling from a 4 to 5 bedroom family house. 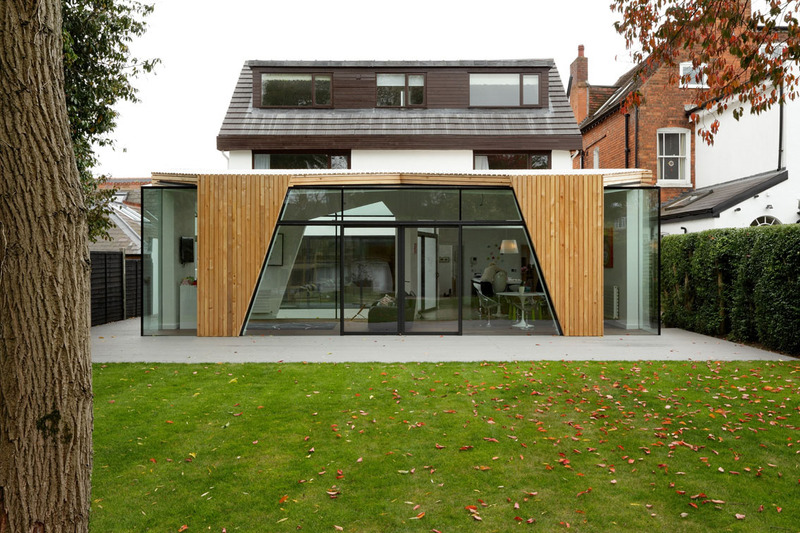 The cedar roof of the glass extension extends down the side of the structure to form wooden cladding that provides privacy. 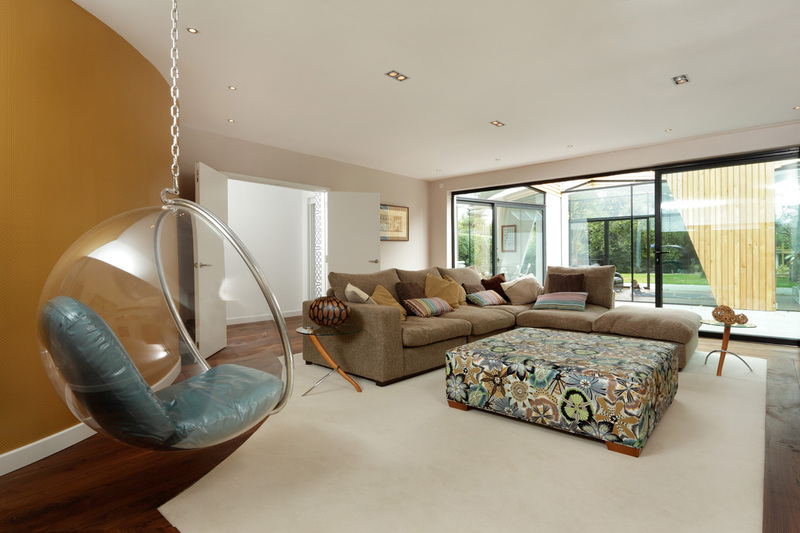 Visit our news page to view the Ideal Home & Homebuilding & Renovating press articles about Wentworth Road. The internal layout has been transformed both in plan and section. At the rear of the property there has been an extension to create an open plan living room and L-shaped kitchen/diner overlooking landscaped gardens and a new courtyard. The stylish kitchen has walnut cabinet fronts that are offset by a grey island and thick white Corian worktops. 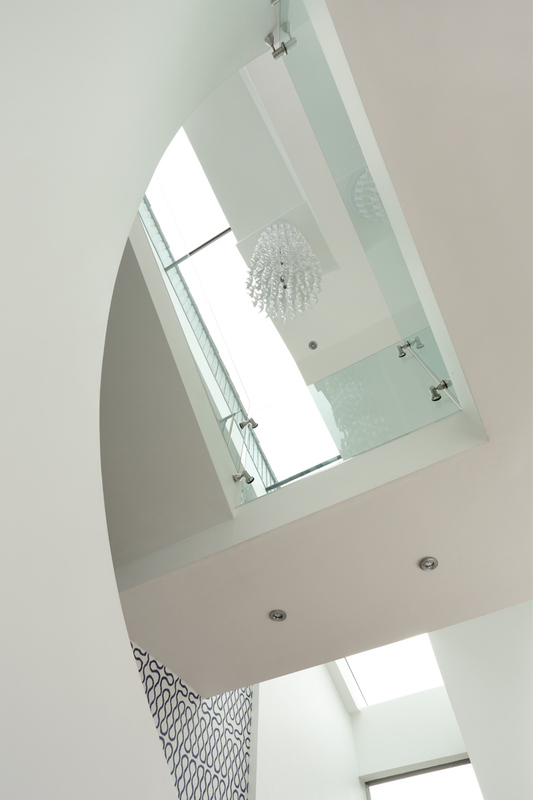 The entrance hall is now a triple height void containing walkways and balconies and is crowned by a large rooflight affording clear views of the sky. 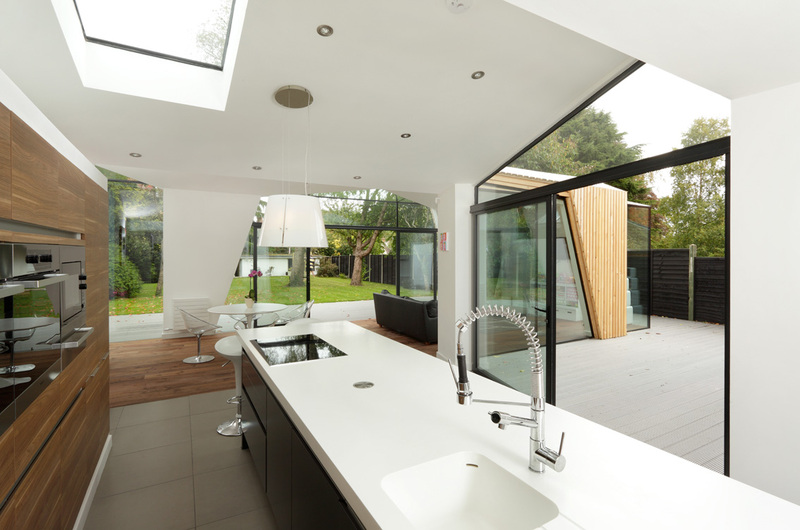 The double glazed rooflight measures 7m x 1.2m and is made from 12mm toughened glass. 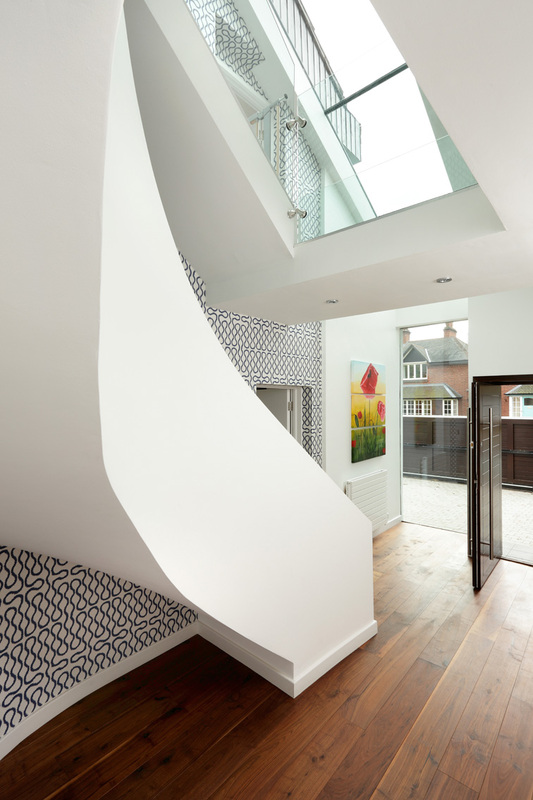 It is set into the sloping roof above the curving staircase. There is a wall of sliding doors opening from the living room and kitchen onto the decked courtyard area. This area is surrounded on three sides by glass walls, as the angled walls in the kitchen splay and become wider as they meet the dining area. The formal lounge also benefits from glass sliding doors that lead onto the newly created courtyard. The family occupying this house can co-exist in the same space while also maintaining relative privacy thanks to the numerous glass walls.